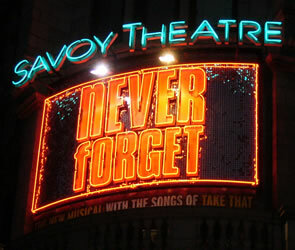 Guide to the London stage musical "Never Forget"
This page is a brief guide to the stage musical Never Forget. It was staged at the Savoy Theatre in London's West End. The running time (including the interval) is 2h40. The story is set in modern times in Manchester. A music manager called Ron has decided to create a Take That tribute band, and recruits five local boys. This musical follows the fortunes of the new band: will it become successful, and if so what impact will this have on its members? English: There are some slang, Manchester accents and references to British popular culture, but the story itself is simple and easy to follow. Age: Suitable for teenagers or adults. 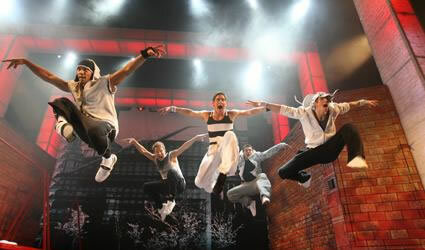 It is especially popular with women in their mid-20's who liked Take That during their teens. Mood: This is a feel-good musical with many comic moments. The sets are quite simple, but there is plenty of energetic dancing. Music: There is music through most of the show. You will enjoy it if you like Take That's catchy pop songs. 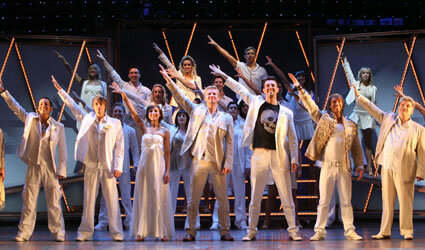 The musical only features songs from before the band's return in 2006. Take That is an English pop group from Manchester. It was created by Nigel Martin Smith in 1990. Originally there were 5 members: Gary Barlow, Howard Donald, Jason Orange, Mark Owen and Robbie Williams. The band had a series of hits between 1991 and 1996, including 8 number one singles in the British charts. Robbie Williams left the band in 1995 to start a very successful solo career. In 2005 a greatest hits album called "Never Forget: The Ultimate Collection" was released, and soon afterwards four of the original band members (all except Robbie Williams) got back together and went on a successful UK tour. Take That released a new album called "Beautiful World": the first two singles from this both reached number one.